The commercialization potential of HVAC air quality monitoring market has lately been experiencing an incline, owing to the rise in public awareness regarding indoor air pollution. The implementation of effective regulations for monitoring and analyzing the indoor air quality worldwide has indeed surged the demand for this product. Not to mention, the HVAC air quality monitoring industry has also received momentum on account of massive investments and funding for comprehensive research activities to develop the monitoring capabilities of these products. As per the United States Environmental Protection Agency (US-EPA), 90% of the life of an average citizen is spent indoors, either in offices, homes or shopping malls. This makes indoor air quality a critical factor under consideration, given that it affects the health, productivity and comfort of inhabitants. Indoor air quality control systems will prove to be essential for keeping buildings and other establishments devoid of harm, especially in an outdoor setting remnant of alarming pollution levels. This in consequence, will help augment the adoption graph of air quality monitoring products in the forthcoming years. HVAC air quality monitoring products are used in quite a significant number of industries like oil and gas, wherein most of the processes involves toxic and combustible materials. In such industries, air quality monitoring systems are utilized to examine toxic gases and materials in air conditioning shafts and ventilation ducts of refineries, as well as in living quarters of offshore rigs. The industrial sector is thus likely to surface as a key application avenue for the HVAC air quality monitoring market, on account of the regulatory frame of reference governing this sector, that mandates the maintenance of air quality in the workplace. Various industries like mining and quarrying industry and even the petrochemical industry are responsible for the release of toxic gases like carbon monoxide, nitrogen dioxide, and/or sulphur dioxide. These industries are governed by an even more stringent regulatory spectrum, to check air pollution content and quantity. This will eventually drive the demand for air quality monitoring products, adding momentum to the growth of HVAC air quality monitoring market in the estimated timeframe. 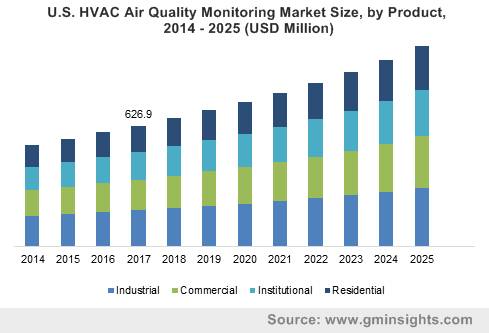 The residential sector is expected to be a viable revenue stream for the HVAC air quality monitoring market, given the product demand across residential buildings. The rising prevalence of smart homes and the growing awareness among people in the developed economies will be a major growth impetus for this industry. A survey conducted last year to discover indoor air quality of northeast China revealed that the average concentrations of CO2 (winter), PM2.5 (winter), TVOC (summer) and HCHO (autumn) were 883?ppm, 0.073?mg/m3, 0.924?mg/m3, and 0.094?mg/m3, respectively. The survey further revealed that the indoor concentration of CO2, TVOC and PM2.5 exceeded the standard limit. The rise of indoor pollution will thus majorly propel the growth graph of HVAC air quality monitoring market from the residential sector in the years to come. Powered by a broad application spectrum, it comes as no surprise that the HVAC air quality monitoring market is touted to garner renewed traction in the ensuing years. For the record, the HVAC air quality monitoring market size is anticipated to cross a colossal of US$6 billion by the end of 2025.